A Thanksgiving-inspired Leftovers Salad with dark greens for a meal that’s rich in fiber, antioxidants, and a creative use for cranberry sauce. If you’re like me, then wasting food doesn’t sit right and I’m always trying creative ways to use food or compost, especially when it’s from the Thanksgiving table. However, after a few days later, you may be tired of eating the same turkey-and-cranberry-sauce combo. I completely get it. That’s why today’s Thanksgiving Leftovers Salad can be your new go-to combination for using leftovers no matter what time of year. 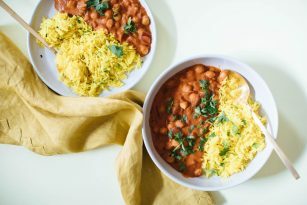 I was hesitant to call today’s recipe a “recipe” because it’s so simple and incredibly versatile. To build the base of your salad, you’ll want any dark greens such as leftover sautéed kale, fresh arugula or spinach. I used fresh arugula, but all of these dark greens will pack a nutrient-dense punch and encourage your body to get back in sync, just in case you got off your routine. Once you have dark greens as the base, you’ll add in any other leftovers you have on-hand — cooked corn, sautéed green beans, fresh apples, diced vegetarian nut loaf, roasted squash, etc. The beauty is in the variety, so don’t be shy about piling on the leftovers with any fresh fruit or vegetables you have, too. Lastly, to top it all off, I made a simple homemade dressing with my Pomegranate Cranberry Sauce—you can use any cranberry sauce here, but ideally, one that uses whole-food ingredients and not from a can—and olive oil, apple cider vinegar and salt and pepper. The best thing about this recipe is getting in those greens! I’m a big fan of leftovers from weekly meal prep and batch cooking on the weekend and that’s no exception for the holidays. A holiday table is one of the best opportunities to get resourceful with leftovers days after the holiday has passed. Pro tip: store leftovers in separate containers, without dressing if possible, to ensure that they can be brought together later as part of your Leftover Salad. Arugula, and other dark greens like kale with their high fiber content, supports healthy digestion. Added bonus if you add Brussel sprouts or cauliflower from leftover side dishes, these cruciferous vegetables have been studied in relation to their cholesterol-lowering effect and may help reduce certain types of cancer. Arugula, spinach, and kale are all rich in antioxidants, and the olive oil in the homemade salad dressing and the cranberries do too. Cranberries are some of the highest sources of antioxidants around, helping our bodies protect our cells from free-radical damage and help reverse the signs of aging. 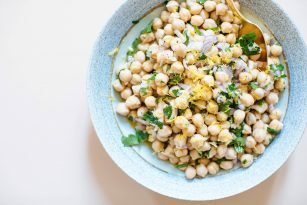 If you are looking to add more protein to this salad, toss in raw nuts like almonds, walnuts, or leftover animal proteins (following the NS philosophy).